Not sure what scores like 1t4 4b7 mean? Check out this post where I tried my best to explain the World Cup scoring system. This coming weekend the circuit moves to Vail, CO and the Teva Mountain Games, a venue that has historically been more friendly to the American contingent. 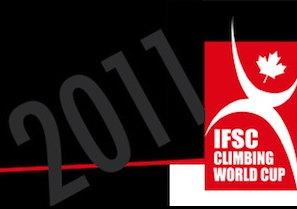 Past notable results include Daniel Woods winning in 2010, Alex Puccio winning in 2009 and Alex Johnson winning in 2008. With 28 out of the 85 registered competitors for this year’s comp being members of team USA the odds, at least from a numbers perspective, are in favor of another strong showing by the U.S.
Last weekend marked the initiation of my first World Cup experience. And my-oh-my, it sure was an eye-opening event in more ways than one. I have never seen so many extremely talented and beastly competitors warming-up their weapons in one isolation. I thought the comp was exciting and entertaining. The men’s problems seemed a little hard, but every problem except for semi-final #3 (I think) was sent. I also enjoyed the mixture of steep walls, slabs, holds and cool features. I don’t think I’d seen a 45 degree wall like the one in men’s final #3(?) in a world cup before. I noticed a lot of the problems tested not only the climber’s strength, but also their balance and precision. Overall, I thought the quality of the stream was good with the exception of about a half hour during the qualifications when it was brutally choppy. The camera angles were great (I especially enjoyed the overhead camera on the last men’s problem). However, as was mentioned in the previous disscussion, the camera seemed to cut away while climbers were mid-crux only to show another climber chalking up (or holds being brushed). Too many times I had to guess the outcome of an attempt based on the reaction of the crowd. In the last two world cups I’ve watched, I ‘ve been mesmerized by the performances of the top women. Jain Kim’s knee drop on Women’s Final #1 was incredible, so was Anna Stohr’s flash of Final #2. I’m looking forward to watching the Teva Mountain games…maybe with some live blogging from Narc? weekend but the live blog should return for the UBC comp in a few weeks.